He was a Tenured Professor at the Medical University of South Carolina and a staff physician in hospitals throughout South Carolina. He is the recipient of the Teacher of the Year Trident/ MUSC Family Medicine Residency award, Golden Oyster Teaching Award MUSC/Trident Family Medicine Residency Program, Navy Achievement Medal for lifesaving medical services rendered to an injured sailor, and numerous Teacher of the Month awards. Dr. Moreno received a BS from Cornell University and a PhD in biology from the University of Colorado, Boulder. Dr. Ashby studied chemistry at Leicester University UK and De Montfort University, Leicester UK. She obtained a PhD in analytical chemistry. Mr. Belizaire earned a Diploma in Civil Engineering from Kingston University (UK) and an MSc in Advanced Structural Engineering from the University of Surrey (UK). Dr. Friedman has a PhD in biology from City University of New York and an MPH from Hunter College (NY). He also holds a BS in biology from Cornell University. Ms. Hartman has earned the following degrees: BAs in international education(Bath Spa University)and English(University of Rotterdam), as well as an MA in English from the University of Leiden. Mr. Isaacs is a graduate of the University of Guyana where he majored in biology and minored in chemistry. He gained a certificate of education from the University of the West Indies. He also holds an MBA from the University of the West Indies. Dr. Jones has a bachelor of science degree from Brigham Young University and a doctorate in physics from the University of Colorado at Boulder. Mr. Reddy received his Bachelor’s degree in Physiotherapy from the Adhiparasakhti College of Physiotherapy and his MSc in Medical Physiology from Kasturba Medical College(KMC). Ms. Ramsey earned a degree in Modern Languages at the University of Westminster in London, England and a Master of Arts in Applied Linguistics and Bilingualism at the University of Newcastle Upon Tyne, England. Dr. Spencer earned the following degrees: BSc and PhD in Chemistry from the University of the West Indies,and an MSc. in Forensic Science from the University of Strathclyde. 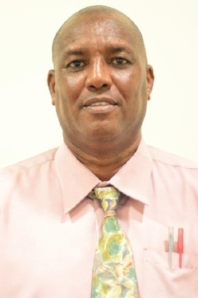 Mr. Gillis was trained in laboratory technology at the Government Technical Institute Guyana, Guyana Mining Enterprise and the University of Guyana.